Peterhead's Jamie Stevenson is pulled back by Ciaran Summers. Peterhead went into this League opener looking to get their season off to a winning start then went from being glad to get a point to feeling they should have indeed taken all three points. Missing the lynchpins of their defence – Scott Ross being suspended and Steven Noble injured – they fell behind early on before fighting back for the draw that over the 90 minutes was about right. The visitors dominated the first period but it was the Blue Toon that could have scored early and late in the half. With only 30 seconds gone, Shane Sutherland cut the ball along the edge of the six-yard box with pace and Stenny defender Stuart Malcolm almost diverted it into his own net until the intervention of keeper Jamie Barclay. That early promise soon turned to sorrow as The Warriors took the lead in simple fashion. An Alan Cook corner on the right was driven was pace into the crowed box where it was allowed to reach centre half Euan Murray who couldn’t believe his luck as he was able to head in unchallenged at the back post. The Blue Toon's Jordan Brown celebrates his equaliser. Six minutes later the lead was doubled with the home defence still reeling, Alan Smith being afforded the time to pick his spot from an angle 12 yards out. 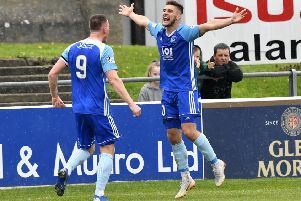 Peterhead looked unable to respond and it took a flying save from Graeme Smith to turn away a curling shot from Colin McMenamin from the edge of the penalty area to keep them in the game. A minute before the break Sutherland set up Nicky Riley who scuffed his effort wide and a way back looked a long one. The turning point came six minutes into the second half. The already cautioned Malcolm foolishly clattered into Riley with an unnecessary challenge on the wing by the main stand and the dynamic of the game was set to change. A Ryan Strachan header was easily dealt with by Barclay soon after but just after the hour mark, Peterhead were back in the game. Stenhousemuir sub Jamie McCormack bowled over Rory McAllister inside the area. Not a malicious challenge by any means but a penalty it was and McAllister coolly sent Barclay the wrong way from the spot. Jordan Brown, sporting a natty pair of luminous pink boots, swung over a cross from the right wing that became a shot as it flashed beyond the back pots but the pressure now being exerted eventually paid off. After 74 minutes a Kevin Dzierzawski cross was deflected goalward and fell perfectly into the path of Brown and he calmly stroked the ball home from six yards with his brightly coloured right boot. A winner was still on the cards as Stenny hung on for the draw that looked a stick on victory at one stage but it never came and in the words of that famous cliché, a game of two halves ended all square. Speaking after the game, Blue Toon boss Jim Mcinally said: “I would have taken a point at half time but I think we did enough to win it. “We said to them after the game that they are going to have to be more street wise and go chasing two nil deficits. “The goals we lost were so soft, a simple corner then we hadn’t recovered from that for the second. “At half time I thought we could still get back into it and they showed great attitude and character. “The sending off opened the game up a bit. “The players can hear the fans shouting to get the ball forward but sometimes what you need to do is move it from side to side and be more patient. The draw in the season opener sees Peterhead sit fifth in the league table with Dunfermline heading the pack after they romped to a 6-1 victory over Brechin City. Peterhead make the long journey to Stranraer on Saturday when they hope they can secure all three points. PETRHEAD: Smith, Blockley (Ferries 65), Baptie (Rodgers 59), Strachan, Gilchrist, Dzierzawski, Stevenson, Brown, McAllister, Sutherland, Riley (McIntosh 75). Meanwhile, Peterhead’s Scott Ross has received a two-game ban after a spitting incident during the recent cup game against Rangers. In a statement on the club website, it stated: “The PFC board have reviewed the video evidence and spoken with the player. “It is clear that Scott did spit in the general direction of Rangers player Nicky Law and Scott admits that he did spit, but it in no way was it intentionally directed towards Nicky Law and is making every effort to speak with Nicky to apologise for the misunderstanding.